If you want to know more about Beckenham LTC junior coaching, contact us. Junior courses run every day of the week – Monday-Friday (4-7 p.m.), Saturdays (9 a.m.-2 p.m.) and Sundays (10 a.m.-12 noon) – during school term-time with our dedicated coaching team, all of whom are LTA qualified, licensed, DBS checked and have first aid qualifications. Juniors aged 4 years old are encouraged to join in our Mini Tennis courses – TOTS (3-5 years old), RED (5-8 years old), ORANGE (8-9 years old) and GREEN (9-10 years old) levels, which provide a perfect and fun introduction to the sport. Using smaller courts, nets, racquets and balls, the coaching team follow an LTA programme so it gives your child the time to progress at his or her own speed. Children aged 11 years plus transition to full courts and YELLOW balls. We offer developments squads right through to top performance juniors at age 16, who are encouraged to hone their skills in inter-club AEGON Junior League matches, in inter-club Kent League doubles matches and also the singles ladder. Beckenham Lawn Tennis Club also offers school holiday courses, plus a chance to compete in the summer junior championship and two LTA Grade 4 tournaments. The popular LTA Grade 4-level AMOSCA Beckenham Junior Open (late July) and AVITA Beckenham Junior Open (late October) each attract more than 150 entries from juniors across the south-east of England (and internationally) and help towards improving your child’s LTA Ranking. Entries normally open three months before the tournament starts. Beckenham encourages juniors to achieve their best within tennis, including encouraging them into tennis coaching. Our coaching team is also available to cater for individual lessons. Prices range from £20-£30 pounds per hour. Please get in touch with our Racquet Sports head Steve Pratt if you have any concerns or feedback about the coaching programme. 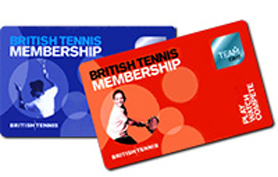 British Tennis Membership gives free membership of the Lawn Tennis Association and allows you to get information about tennis and receive newsletters from them. If you wish to find out all the terms and conditions of the LTA please click here. We recommend that all our young players visit the CRY website which explains cardiac risk in the young and how to arrange screening. Please get in touch if you or your company are interested in building a partnership with Beckenham Lawn Tennis Club.